It's tough to be a Bangladeshi. 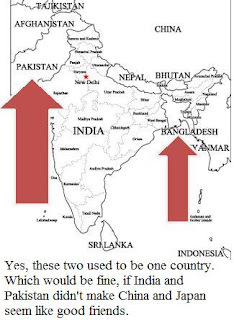 As though crippling poverty (per capita GDP of $638 in 2010), yearly monsoons, massive overcrowding, and the fact that your country is sinking isn't enough, they're also the (relatively) completely insignificant member of a subcontinent that includes the world's largest democracy in India, and a country that steals headlines in the US and Europe for their alleged ties to terrorism in Pakistan. And OhByTheWay, they're also in the same neighborhood as such countries as China. In yesterday's blog post, I spoke very briefly about the fact that climate change in this century will cause an acceleration in the migration of people from one place to another. One of the most dramatic examples of this will be the country of Bangladesh, a place that most people from the US have probably at least heard of, and one which some (read: very, very few) people in the US even know a little bit about. I would imagine that the most mainstream exposure that people in the West have had to Bangladesh would have been George Harrison and Ravi Shankar's "Concert for Bangladesh" in 1971, one which was meant to raise money for a country ravaged by a civil war/war of liberation. Realistically, there's absolutely nothing wrong with 99% of people in the West knowing nothing about Bangladesh. Yes, a lot of our clothes and other textiles are made there. And yes, it is the 8th most populous country in the world (more people than Italy, the UK, Netherlands, and Belgium. Combined). But speaking completely honestly, it is a dirt-poor and undeveloped 3rd world country in every sense of the phrase, with about as much political clout and relevance in the West as, let's say, the Mexican province of Chiapas. However, I guess one could say I woke up this morning hoping to educate some people (i.e. the 5 readers of this blog) about Bangladesh. It's a pretty fascinating (and fast-disappearing) place. became, for whatever unbelievable reason, a part of newly formed Pakistan, known as the province of East Pakistan. Those familiar with their South Asian geography may point out--isn't that area separated from the country of Pakistan by, well, India? Yes, that is correct. I recall reading at some point that during this rather awkward time of geopolitics, flights going from East Pakistan to Pakistan (quite common, given they were domestic flights) had to fly around India, as India would not allow them in their airspace. Given that the Himalayas are to the north, the flights had to fly around the southern tip of India. Inconvenient. Anyway, this ended in 1971, when Bangladesh, with the help of India, won an extremely bloody war of independence against Pakistan. This was inarguably one of the most devastating wars of the latter half of the 20th century, and the atrocities committed still resonate with many people today. Bangladesh has about 56,000 square miles of land. This is approximately 1.5% the size of the United States. Their population of some 158 million, is just over half that of the US. For those keeping track at home--that means that Bangladesh has a population 28 times denser than that of the United States. Put another way, in a place slightly larger than Greece, there are 16 million more people than there are in... Russia. All of which contributes to a population density of 2,496 people per square mile. Which is good for the 12th highest population density of any sovereign state in the world. Now one might say, "well there are 11 places that are more dense! It's not so bad!" Not quite. Among the 11 places above Bangladesh are the Vatican City, Gibraltar, Macau, and Monaco. In fact, the most populous state in the top 11 is Hong Kong, with a paltry 7 million people. 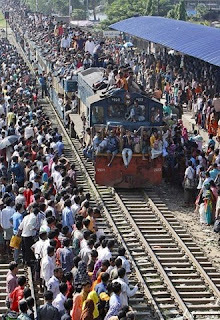 No where else in the world is there the insane combination of such dense population over such a (relatively) vast area. Which would all be inconvenient enough, even if the country wasn't sinking. Which, by the way, it is. About 75% of the land in Bangladesh is less than 10 meters above sea level. And given the yearly flooding that takes place there, a lot of this land ends up underwater at some point throughout the year. How much, you ask? Try something like, 75% of the country flooded in 1998. In 1988, a 20-day flood covered 60% of the country's land area, and in 2004, 2/3 of the country was underwater. Annually, on average about 18% of the country is flooded. 20 million "environmental refugees" in Bangladesh. Overall, certainly the situation doesn't seem real promising. However, that's not to say there's nothing good about Bangladesh. Hardly! Bangladesh is home to BRAC, the largest nonprofit organization in the developing world, with revenues of nearly half a billion US$ in 2009. Additionally, among the 160 million or so Bangladeshis is a Nobel Laureate, Muhammad Yunus. A recent National Geographic article on Bangladesh hailed its people as remarkably resilient, and commented that their massive population could be a whole lot worse--their birth rate has fallen from 6.6 children per woman in 1977 to 2.4 today, "a historic record for a country with so much poverty and illiteracy". Additionally, their infant mortality rate has dropped from 100 per 1,000 births in 1990 to 43 per 1,000 births today. Some really remarkable improvements for such a populous and disadvantaged country. Overall, surely Bangladesh is a country with its share of problems. It suffers from too many people with too little money, and the unfortunate consequence of being located at such an elevation as to suffer mightily from a climate change that, realistically, they're doing very, very little to cause. I'm certainly not trying to say that Bangladesh is the only country with these problems (look no further than Maldives if you want to see the effects of rising sea levels), nor am I trying to drum up popular support for sending aid to Bangladesh. Simply put, I woke up this morning feeling like educating some people about a country that tends to not get much publicity. So there. For those who read this incredibly random tangent, I hope you enjoyed it, and that you now know a little bit more than before about Bangladesh. Make sure to come back tomorrow, if for no other reason than to see what ridiculous topic I pull out of thin air for that post. For further reading, I really do highly recommend checking out this NatGeo Article from May 2011. It's pretty short, has a really great photo gallery, and provides some good insight into the current situation in Bangladesh.